The spectacular ISTAF INDOOR meeting on Friday evening in Berlin sets the international indoor athletics season in Germany in motion. Close to 12,000 tickets have been sold for the ISTAF INDOOR, by far the biggest indoor meeting in the world. Spectators in the Mercedes-Benz Arena will see Olympic champions, World and European gold medallists in action along with what should be thrilling contests and innovative features. Among them the men’s pole vault is likely to be a thriller once again with the Olympic champion Thiago Braz da Silva from Brazil, the World Champion Sam Kendricks of the USA and last year’s winner Piotr Lisek of Poland in the line-up. As for the sprints, Britain’s European 100m silver medallist Reece Prescod runs the men’s 60m and local favourite Gina Lückenkemper goes in the women’s event. Regarding innovation, men and women will compete against each other for the first time in the discus. Olympic champion Christoph Harting will be on the men’s team. “The ISTAF INDOOR will once again offer an evening of spectacular sport. 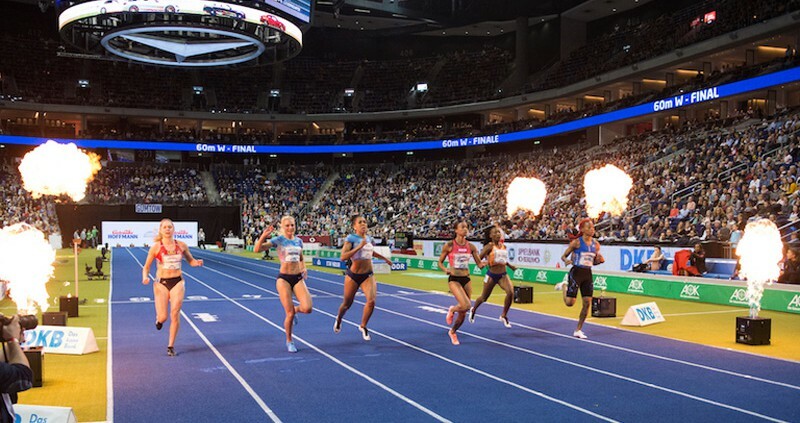 Spectators can look forward to seven events packed with star talent while the athletes relish the unique atmosphere which Berlin provides,” said the meeting director Martin Seeber. Another innovation for the sixth edition of the ISTAF INDOOR will be a Fan Zone in the Arena where spectators can meet athletes throughout the evening. “ISTAF INDOOR is all about getting right up close to top-class sport. We want to break down the distance between athletes and fans, making stars and role models in track and field accessible,” explained Martin Seeber. In the discus a team of four men will take on a women’s quartet in direct competition. Whoever throws further scores double points (2 for the winner, 1 for the loser) – and the winning team is the one with most points at the end. Three of the men’s team have already experienced victory at the ISTAF INDOOR: the German duo of Christoph Harting in 2017 and Martin Wierig, the meeting record holder, who won with 64.82m in 2014 and last year’s winner Lukas Weißhaidinger of Austria. Gold, silver and bronze – the complete set of medallists from the 2018 European Championships will be lining up for the women’s 60m hurdles. The German hurdling aces Pamela Dutkiewicz (silver medallist) and Cindy Roleder (bronze) will compete against the Belarussian Champion Elvira Herman. On the men’s side the European outdoor champion Pascal Martinot-Lagarde of France should be a strong contender as will be Balázs Baji. The Hungarian won the event at the 2017 ISTAF INDOOR and finished runner-up last year. Already showing good form at this early stage of the season is the German champion Gregor Traber, having run 7.69 indoors this year. The men’s pole vault once again has a strong field including three who have cleared 6 metres: the reigning World champion Sam Kendricks of the USA as well as the Olympic gold medallist Thiago Braz da Silva from Brazil and last year’s winner Piotr Lisek of Poland. Add their rivals Raphael Holzdeppe, the German number one, and Paweł Wojciechowski from Poland who have both won world titles in their careers and world-class performances can be expected. One late withdrawal is the world record holder from France, Renaud Lavillenie, because of injury.